Ah, can you just hear the rustling of the palm leaves in the ocean breeze? 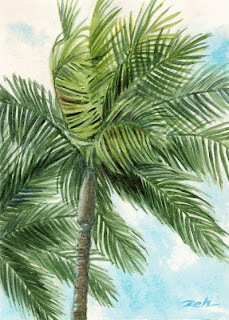 These Palmettos were in Bermuda which I just recently visited. The moist soft air flowed with a constant breeze by the white sandy shoreline. In Bermuda, you are never farther than 1/2 mile from the ocean as the main island is only 1 mile across at its widest point. So, if you like the salt water, it's a good place to visit. These palms are salt tolerant and they grow right along the shoreline even up to the water's edge. This painting is #4 of the BERMUDA COLLECTION.